Saskatchewan Air Ambulance Service - patient being unloaded from Cessna 195 (after mercy flight) for transfer to city ambulance. The Johnson-Murphy Funeral Home in Regina joined with Skinner's Air Service by providing a ground ambulance to meet all mercy flights into Regina. Skinner's rate was 15Â¢ per mile, each way. On March 15, 1936, Skinner flew down to Harptree to collect a woman with a ruptured appendix. On the return flight, after dark, the revolving beacon light, unlit for the previous four years, was turned on to guide the plane to a safe landing. At other farms, Skinner would arrange for special markers to denote the pick-up point: a pair of overalls on the top of a windmill, a large circle of hay in the snow, or a black column of smoke from a ground fire. Speers Funeral Home then bought a Waco cabin biplane that could carry a stretcher and held the engine heat for increased patient comfort. 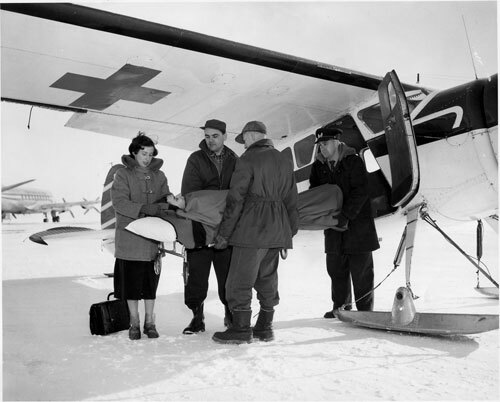 During the late 1930s, hundreds of patients were brought to Regina, with Charlie Skinner, Steve Albulet and Harold Batty as pilots. Soon after World War II the government, instigated by Keith Malcolm, introduced the Saskatchewan Air Ambulance service. The first aircraft was a Noorduyn Norseman, based at the Regina airport; and the first mercy flight was to Liberty on February 3, 1946. By the end of August, it had completed over a hundred trips, and a second Norseman was purchased. A Fairchild Husky was added in 1947; and a Cessna 195 and a two-engine Cessna Crane were added to the fleet in 1948. Don Campbell, after wartime service with the RCAF, flew for the ambulance for over thirty years. His experiences are described in his book, Wings of Mercy (1993), together with a list of all pilots, nurses and engineers involved. Irene Sutherland, RN, joined the air ambulance service in December 1946 and became its chief flight nurse six years later. Regina was the sole base of operations for the Saskatchewan Air Ambulance Service from 1946 until 1953, when the Saskatoon base was added. The Regina base closed in 1994. Average trips per month increased from less than twenty-five per month in the early 1990s to over 100 by 1999, and distances increased as more patients were sent out of province to obtain specialty services not available within Saskatchewan. Beechcraft King B200 turboprop aircraft, less costly to operate, each with two-stretcher capability and seating for three medical crew, were purchased in 2001 and 2002.